1. A Senior Secondary School Certificate (+2) or its equivalent qualification from a recognized Board /University / Institution. 2. Having a typing speed of 35 w.p.m. in English or 30 w.p.m. in Hindi Typewriting through Computers. Candidates are required to visit the college website i.e. 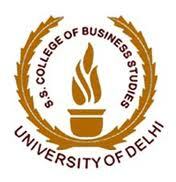 www.sscbs.du.ac.in for filling the online application form and for the detailed advertisement. The date of submission of online form is from 03/11/2018 to 24/11/2018. 1 Candidates are required to appear in a written test/skill test/interview to adjudge the basic knowledge as per the requirement of the post. Those candidates who qualify the written examination/skill test or any other test applicable to that post will only subsequently be called for interview, wherever applicable. The selection shall be based on the performance of the candidate in the written test and interview. 2 All the posts will be filled as per the Recruitment Rules of the University of Delhi. The qualification and other service conditions shall be such as prescribed by the University of Delhi/U.G.C. from time to time. Junior Assistant Vacancy – Last Date 24 November 2018, Shaheed Sukhdev College of Business Studies (SSCBS) recruits Junior Assistant post. Candidate with 12th Pass experience can apply. Shaheed Sukhdev College of Business Studies (CBS) is one of the premier institution of the University of Delhi, imparting education in the fields of management and information technology with excellence and vision. It was established in August,1987 by the Delhi Administration on the initiation of UGC and the Ministry of Human Resources. The vision behind the college was of its first principal Dr. S.S. Gulshan. When the college was established it was named as “COLLEGE OF BUSINESS STUDIES ”. But later the college was rechristened as ‘ Shaheed Sukhdev College of Business Studies’ in 1997, to pay homage to Indian revolutionary Sukhdev Thapar who along with Bhagat Singh and Shivaram Rajguru became part of independence folklore for their sacrifice.